NOTE: These kits are designed for the serious artist or for those looking to get started practicing Henna professionally. You also save money (10-15%) by purchasing these items together rather than individually. This is the ULTIMATE OPTION to preserve your "Modern Design Books" - in the past I've gone through at least 2 sets of Design Books/Folders a season working outdoors, until finally last year I smartened up and Laminated my books, I recommend you have this option applied if you plan on working outdoors (if indoors the option above will probably be suitable), remember that eventually you WILL get stuck in rain (or hail!) and you'll wish like heck you listened, I know it's not cheap but it's well worth it (the cost is based on labor/needed equipment). This option allows your designs to be made on High Quality Heavy Stock Paper and formatted into a three ring folder. NOTE: If ordering the Max Ultimate Professional, Ultimate Professional, or Professional Henna Artist Kit - please adjust the quantity in your cart to 2. Contents Include: - 1) 4 Lg. Modern Henna Design Books (4 books total - all 4 books are the same!) - 2) 1 Traditional Design/Instructional Book - 3) 1 Med. Traditional Design Book - 4) Two 10 oz. net weight - enough Paste to do 800-1000 Designs) bottles of Premixed Natural Henna which stains the skin a Brownish/Orange to Mocha Color (use Lg. Bottle for filling/refilling the 1.5/2.5 oz. bottles) - 5) Two 1.5 oz. Bottles w/ 9mm metal applicator tips (for fine line work) - 6) Two 2.5 oz. Bottles w/ 16mm metal applicator tips (for larger work) - 7) 4 Pins (for clearing clogged applicator tips - 8) Stencil Pencil - 9) Stencil Marker - 10) 50 sheet pad of Stencil Paper - 11) Stencil Transfer Gel & instructions - 12) 100 Stencils (10 sheets) - 13) 2 Bottles of Mehandi Oil - 14) Reconstituted Lemon Juice (for cleaning the skin) - 15) Instructions/Aftercare - 16) A very helpful Supplies list I put together which also includes a festival supplies list and a miscellaneous supplies list - 17) Discount Certificate (save money of future orders) - 18) Misc. items such as Cotton Balls, Q-tips, Safety Pins, Hair Bungies, & Tooth Picks - 19) Shipment Weight = Approximately 7.6 Pounds. NOTE: This is the same kit as above except; 1) you get one 10 oz. bottle of Henna (enough Paste to do 400-500 Designs & stains the skin a Brownish/Orange to Mocha Color) for refills instead of two 2) The Kit above has 1 additional Traditional Design Book and 3) The Kit above has 2 additional Modern Design Books. Contents Include: - 1) 2 Lg. Modern Henna Design Books - 2) 1 Traditional Design/Instructional Book - 3) 10 oz. (net weight - enough Paste to do 300-450 Designs & stains the skin a Brownish/Orange to Mocha Color) bottle of Premixed Natural Henna (used for filling/refilling the 1.5/2.5 oz. bottles) - 4) Two 1.5 oz. Bottles w/ 5mm metal applicator tips (for fine line work) - 5) Two 2.5 oz. Bottles w/ 9mm metal applicator tips (for larger work) - 6) Stencil Pencil - 7) Stencil Marker - 8) 50 sheet pad of Stencil Paper - 9) Stencil Transfer Gel & instructions - 10) 100 Stencils (10 sheets) - 11) 2 Bottles of Mehandi Oil - 13) 4 Pins (for clearing clogged applicator tips) - 14) Reconstituted Lemon Juice (for cleaning the skin) - 15) Instructions/Aftercare - 16) A very helpful Supplies list I put together which also includes a festival supplies list and a miscellaneous supplies list - 17) Discount Certificate (save money of future orders) - 18) Misc. items such as Cotton Balls, Q-tips, Safety Pins, Hair Bungies, & Tooth Picks. Contents Include: - 1) 2 Lg. Modern Henna Design Books - 2) One 1.5 oz. Bottle w/ 5mm metal applicator tip (for fine line work) - 3) One 2.5 oz. Bottle w/ 9mm metal applicator tip (for larger work) - 4) 10 oz. (net weight - enough Paste to do 300-450 Designs & stains the skin a Brownish/Orange to Mocha Color) bottle of Premixed Natural Henna (used for filling/refilling the 1.5/2.5 oz. bottles) - 5) Stencil Pencil - 6) Stencil Marker - 7) 50 sheet pad of Stencil Paper - 8) Stencil Transfer Gel & instructions - 9) 70 Stencils (7 sheets) - 10) 1 Bottle of Mehandi Oil - 11) 2 Pins (for clearing clogged applicator tips) - 12) Reconstituted Lemon Juice (for cleaning the skin) - 13) Instructions/Aftercare - 14) A very helpful Supplies list I put together which also includes a festival supplies list and a miscellaneous supplies list - 15) Discount Certificate (save money of future orders) - 16) Misc. items such as Cotton Balls, Q-tips, Safety Pins, Hair Bungies, & Tooth Picks. Contents Include: - 1) One 1.5 oz. Bottle of Premixed Natural Henna w/ 5mm metal applicator tip (for fine line work) - (enough paste to do 25-30 designs & stains the skin a Brownish/Orange to Mocha Color) - 2) One 2.5 oz. 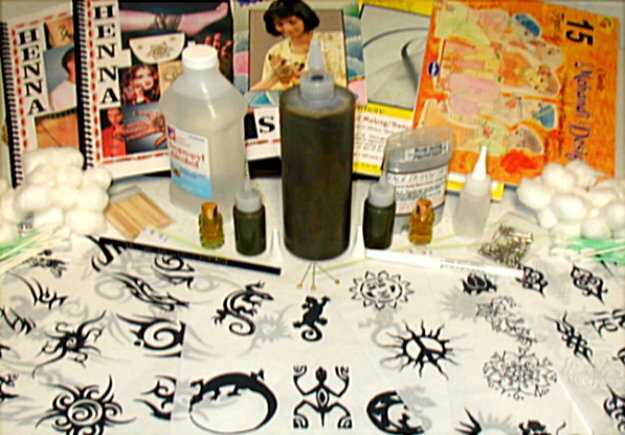 Bottle of Premixed Natural Henna w/ 9mm metal applicator tip (for larger work) - (Enough Paste to do 50-60 Designs & stains the skin a Brownish/Orange to Mocha Color) - 3) Medium Modern Design Book - 4) 40 Stencils (4 sheets) - 5) Stencil Pencil - 6) Stencil Marker - 7) 50 sheet pad of Stencil Paper - 8) Stencil Transfer Gel & instructions - 9) 2 Pins (for clearing clogged applicator tips) - 10) Reconstituted Lemon Juice (for cleaning the skin) - 11) Instructions/Aftercare - 12) Discount Certificate (save money of future orders) - 13) Misc. items such as Cotton Balls, Q-tips, Safety Pins, Hair Bungies, & Tooth Picks.